Share the post "Podcast Episode 27: How to Cope with Feeling Overwhelmed"
Having “too much” work is usually seen as good news for a freelancer, but it can become overwhelming and stressful at times. In this episode of the A Little Bird Told Me podcast, I talk about how to cope with feeling like you just have too much on your plate, and aren’t sure how to manage. Hello, and welcome to Episode 27 of A Little Bird Told Me: the podcast about the highs, the lows, and the no-nos of successful freelance writing. I’m Philippa Willitts, and today I’m going to be talking about coping with feeling overwhelmed as a freelancer. Before I start, I want to tell you that you can find us on the internet at alittlebirdtoldme.podomatic.com, and there you can find links to subscribe to this podcast in any number of ways, including RSS feed, iTunes, Stitcher Smart Radio or just on the Podomatic page itself. You can also find the link to our Facebook page – we love to hear from you and Facebook is just one way to do that. On our Podomatic page, you can also find links to our social media feeds and websites. I’m Philippa Willitts and I’m here without my usual co-host Lorrie Hartshorn as this is another solo episode. So, as I said, I’ll be talking about feeling overwhelmed. It happens to us all at times – maybe you’ve had a tonne of work arrive on your desk, or you might just be panicking at the kind of enormity of what you’re doing, running your own business, managing everything yourself, being responsible for your own pay packet…that in itself can be overwhelming! It’s not always easy to manage your workload as a freelance and it’s hard to say no, particularly if your workload is quite insecure and you don’t want to say no to anything in case you never get any paid work again! And because of that, sometimes we can end up with just too much on our plate. There are so many different skills and tasks you have to master, you can start to panic. Other people might just withdraw, say, “I can’t do this!” and switch off, or just procrastinate for a while – we’ve probably all done that! So when you’re feeling overwhelmed, the first thing is to work out exactly what you have to do and when you have to do it and when you have to do it. You might feel like you know this because it’s all in your head in long mental lists, but actually, breaking tasks down into their components can make them immediately feel much more manageable. Divide up a piece of paper, chalkboard, whiteboard, whatever way suits you, for the next few weeks. If you know you have to write three blog posts by Tuesday, a sales letter for Thursday, four press releases for Wednesday…just write down every deadline you’ve got over the next few weeks. Then, you can start to rationalise that actually, although some of it may be a stretch, the massive mix up of work in your head isn’t quite so confused and overwhelming. What you can also do is start to plan out when you’re going to do what. You might have a few deadlines for Monday and then loads of deadlines on Friday. Planning out which pieces of work that are due in on Friday are going to be done on which day…divide it up so you know what you’re doing on Tuesday, Wednesday. You’ll realise that having 12 deadlines for Friday isn’t quite as scary as having three deadlines a day between now and then, for example. If you’re still overwhelmed, look at each task and break it down further. Rather than saying, “Press release”, break it down into “research press release”, “double check client’s preferred format”, “leaving for 24 hours and proof-reading properly”, “writing out a plan, filling that out and reviewing it…”, “adding notes”, “checking format”. Breaking tasks down into the smallest components possible really helps me, I can look at a task and think, “OK, I have to research this”, which is smaller and easier but helps me get to the overall aim of getting the press release done. Different people prefer different ways of planning – it might be a to-do list on paper or a mega complicated computer programme. You might follow the GTD (Getting Things Done) system, or your own preferred way of managing and planning. Now’s the time to really make the most of your systems and do everything you can to make your next few weeks as planned and organised as possible. Another thing to remember when you’re feeling overwhelmed is that you mustn’t used that as an excuse to not take a break – even just 10 minutes away from your desk, popping outside, making a cup of tea or listening to the radio can clear your mind and give your brain and your fingers the rest they need to carry on. And usually, even if you think you can’t spare 10 minutes, it can really clear your mind so that when you restart you will feel more in control. Something else to consider – and it might seem a bit strange when you’re panicking about work – is to surround yourself with calmness! Make your desk neat and tidy, so you don’t get stressed just looking at it, control your to-do list – if it’s eight different pieces of paper, each with three different tasks on, it just doesn’t help. Also, if it’s full of things that might be nice to do but aren’t actually necessary, when you’re overrun with work, take those off it. Make sure your list reflects just exactly what you need to do. Other things can come back on when work slows down. Also, in terms of feeling calm, don’t be tempted to drink eight double espressos to keep going – it’ll just give you the jittters and make you feel more stressed than you already do. If you really want to help, try something like chamomile tea, but to be honest, it’s so gross I can’t recommend it! Another thing to consider, if you’re feeling panicked and overwhelmed, is to ask for help. This can be to ask for someone’s advice or support on how to cope with how you are feeling. I know that Lorrie – my usual co-host – and I do this quite a lot. We’ll send the other one an email, going, “Argh, I can’t manage, I have too much to do!” and the other one will reply with reassuring words or useful advice. Sometimes, just getting someone else’s perspective can really help. The other way to ask for help is actually to ask for practical help, if there are any work-related tasks you could pass on to somebody else. This might be paying a friend to do your accounts for that week, or hiring a VA for 3 hours to find information for your research, or fact check and proofread your articles. These are quite handy, one-off ways of dealing with a massive workload, even if – in the normal running of your business – you don’t need to hire staff to help you out. There are also tasks that are important but don’t take much mental energy. So, things like doing some filing, transferring figures into a spreadsheet, double-checking article formatting so they’re all the same…so those kinds of tasks can be good for those points of the day (tends to be mid-afternoon for me, where I just think, “I can’t think, I can’t do anything!”). You still feel good that they’re done but you haven’t had to use any precious mental energy, so you can use that for writing later when your energy picks up again. Now, when we’re overwhelmed, there’s a massive temptation to multitask. But focusing on one thing at a time is a lot more productive and a lot less hectic for your brain. Trying to multitask when your mind is in a panic is destined for disaster. So, don’t be mentally planning one article while writing another, and keeping half an eye on your email inbox, all at the same time. We all kind of do this, but try your best to keep your focus back and think about what you’re doing before moving onto the next thing. It’s calmer, it’s more productive and you tend to do much better work. Now, the next suggestion for managing overwhelm as a freelancer is certainly easier said than done, but it’s really helpful if you try to reframe how you perceive what’s happening. We all get caught up in, “Oh my god I’ve got too much to do!”, while forgetting that having a lot to do is really a sign that your freelance writing business is going well. It means you’ve either got a lot of clients or that the clients you’ve got really value you and are sending extra work your way. We get caught up in the moment and panic, but if you step back,and reframe, you can think that people like what you’re doing, that you’re marketing yourself well, and that you’re doing a good job. It’s often a good thing even if it doesn’t feel like it when you feel like you’ve done nothing but type for days. And at some point, maybe within a week or a month, your workload will calm down and you’ll get some breathing time. But don’t just stop! It’s the ideal time to get on top of those regular, predictable tasks that you might have been skipping when things were hectic. 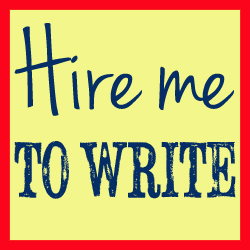 Sending out marketing information, managing your social media feeds, replying to emails that might have been overlooked…it’ll get you back on track with what you were doing and then, the next time you feel overwhelmed, you’ve already got ahead and you can get on with the writing work. So while feeling overwhelmed can be awful, hopefully these tips will help you manage it when it feels bad. Sometimes, feeling overwhelmed can give you a real buzz; it’s not necessarily a 100% bad experience. If you’re getting on with it and doing a good job, it can feel brilliant, boost your confidence, focus on things that are important. But if it does start to feel stressful and unpleasant, do consider planning things, breaking things down, getting your to-do list under control, taking breaks, asking for help, using points where you feel like you can’t think to do repetitive, dull tasks, aiming for uni-tasking rather than multi-tasking, and trying to reframe what’s happening in a positive light, and hopefully that will help make the experience a bit better when stress overwhelms you. Now it’s time for my Little Bird Recommendation of the week. This week, it’s a TED talk. Now, you’ve probably come across TED talks – they’re speeches that are usually under 20 minutes, often under five, that are inspirational, clever, funny, informative, and if you just search on Google or YouTube, there are hundreds of the things about any topic imaginable. The one I’m recommending this week is by Renny Gleeson, and it’s called “404: The Story Of A Page Not Found” and it’s about those dreaded error 404 pages you find when your page cannot be found. We’ve all seen them and they’re kind of frustrating. This talk kind of reframes them – Renny Gleeson talks about some brands that have turned it around and made their 404 pages fit in with the whole ethos of their website, whether they’re funny or meaningful. The real message of this video is that things can go wrong, and we all make mistakes that can be dreadful, but it doesn’t have to be a disaster – as long as you handle it well, it can be a positive thing. And so that’s my recommendation this week – if you go to alittlebirdtoldme.podomatic.com, there’s a link to the video there. I really hope you’ve enjoyed this podcast. I’ve been Philippa Willitts and we’ll see you next week.